Weekend Historical Happenings: 9/15/12 - 9/16/12 ~ The History Girl! The Atlantic Highlands Historical Society is hosting its 34th annual Outdoor Flea Market at the Atlantic Highlands Marina (off First Avenue) on Saturday from 10:00 am to 4:00 pm. The rain date is September 15th. 100 vendors will be selling something for everyone. A variety of antiques and collectibles, crafts, and new items will be offered. 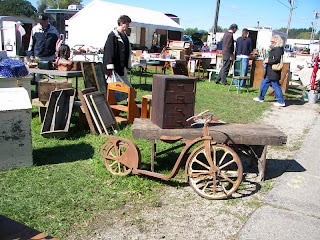 Furnishings, household wares, toys, clothing, tools, new and collectible books, lawn ornaments, turn of the century postcards, jewelry, and fishing tackle are among some of the varieties of merchandise to be found. Refreshments and a variety of food and baked goods will be available by the society. Society members will also be on hand to answer questions about the society and its various programs. Enjoy for a day of browsing and searching for that something you just can't do without. For more information about the Atlantic Highlands Historical Society visit www.atlantichighlandshistory.org. Proceeds from this event are used to maintain and restore the Strauss Mansion Museum at 27 Prospect Circle and provide educational programs throughout the year. The museum is open to the public each Sunday from 1:00 until 4:00 pm. Before television and before motion pictures, Lotta Crabtree was the most popular actress in America. 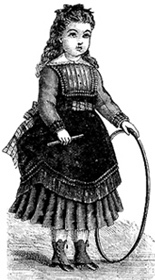 Born in New York City in 1847, Lotta began performing at the age of six in the mining camps of the California gold rush and soon rose to fame and fortune. Famous enough to be known simply as "Miss Lotta," she was the most popular actress of her era, performing a musical comedy act loved by audiences of the day. From the 1870s through the early 1890s her popularity (and income) even surpassed the great Sarah Bernhardt. In her one-woman show, actress Judith Helton brings Lotta back to life. Ms. Helton has entertained audiences throughout California with her unique program and now will bring her act to New Jersey with an appearance at the Palace Theatre in Netcong on Saturday at 7:30 PM. Why Netcong you ask? Lotta Crabtree maintained a summer cottage at Lake Hopatcong for many years - just a few miles from the theater. She is considered one of the lake's most famous residents, having helped establish the lake's previous fame as a great northeast resort. Tickets are now on sale for $15.00. For reservations, please call the Lake Hopatcong Historical Museum at 973-398-2616 or email LHHISTORY@att.net. New Jersey Soldiers in the Civil War: A Talk by Joseph Bilby will be held at the New Brunswick Public Library on Saturday between 2:00 and 3:00 pm in the Community Room. The library is located at 60 Livingston Avenue, New Brunswick. The Civil War comes to life on Saturday and Sunday from 10:00 am to 4:30 pm. Visitors can tour Union and Confederate camps and meet authentically clad and equipped military and civilian reenactors, who will discuss the everyday lives of Civil War soldiers and the roles civilians played in supporting them. Historian Mike Kochan, who played a vital role in the recovery of the Confederate submarine H.L. Hunley in 2000, will have a display of Civil War-era naval and telegraph technology. Educator and weapons expert Jack Meyers will be in the Village Welcome Center with a large display of Civil War-era firearms. Visitors can also enjoy period music from the Camptown Shakers at the Dennisville Inn. Historic Cold Spring Village is a non-profit, open air living history museum that portrays the daily life of a rural South Jersey community of the Early American era. Its mission includes the preservation of 26 historic Cape May County buildings, history education and promoting heritage tourism. The Village is a museum for all seasons. During the summer months, interpreters and artisans in period clothing preserve the trades, crafts and heritage of "the age of homespun." From October to May, the emphasis is on teaching history through school trips to the Village, classroom visits by the education department and interactive teleconferences with schools throughout the United States. The Walpack Historical Society presents Myra Snook and Frank Hennion who will present a discussion on the Shapanack Cemetery. The discussion will be held at the Walpack M.E. Church, Walpack Center. Bring a picnic lunch at noon. Meeting and speaker at 1:00 p.m. Questions? Call 973-948-4903. Experience 18th century toys and games at the Miller-Cory House, 614 Mountain Avenue Westfield, NJ 07090. The life of a child in early America was filled with long hours of hard work, particularly in a country household. However, once chores were finished and lessons were learned, there was time for play and fun. Our program includes a display and description of a variety of toys from colonial days. Visitors can have fun themselves trying out all the toys, including dominoes, pick up sticks and many others. Also included are tours, as well as a demonstration of open hearth cooking in the museum's Frazee Building. Built in 1740, the Miller-Cory House stands on the “road to the mountains” in the West Fields of Elizabeth. While the Millers and the Corys were rural farmers, they knew some degree of sophistication, for the West Fields were at the crossroads of colonial America on the Old York Road, the main road between New York from Philadelphia. Life was uniquely influenced then, even as it is today, by a location between the two major cities. The Andover Museum will be open to visitors from 1:00 - 4:00 pm on Sunday. The museum is open the third Sunday of each month, as well as by appointment. It is located upstairs in the Andover Borough Municipal Building at 137 Main Street/Route 206, Andover Borough, NJ. There is ample parking located behind the building and the museum entrance is on Smith Street. This month's theme will be school and fall harvesting. Learn what school life was like during the 1800s and how harvesting influenced your attendance. Sunday, December 16th (Christmas/New Year's) - Followed by Historic Christmas Tree Lighting Ceremony, at the Main Street Park Gazebo. All are welcome - Members and Non-Members. For additional information about the Museum or to join the Historical Society of Andover Borough, please call (973) 786-7833 or email: historyandovernj@aol.com. To celebrate National Constitution Week, the historic Trent House will honor this revolutionary document with a narrated program of special patriotic music by the Capital Singers of Trenton, directed by Richard Loatman. The grounds open 12:30 pm and the music begins at 1:30 pm. If you missed the Trent House's 4th of July picnic and patriotic concert, here's another opportunity to hear this wonderful selection of music. Suggested donation $5.00. The William Trent House is located at 15 Market Street, Trenton; For more information, call the museum office at 609-989-3027 or the Trent House Association Office at 609-989-0087. 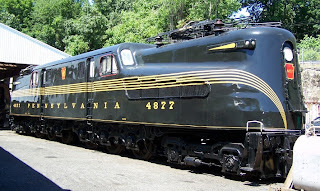 See the largest electric locomotives that ever operated in New Jersey on Saturday between 10:00 am and 5:00 pm. They were the famous 1930s GG-1 giants of the rails that traveled over 100 mph between NY City and Washington DC. This event is sponsored by the United Railroad Historical Society of New Jersey. See a variety of old diesel locomotives, passenger cars, and freight cars. Also, in the early 1900s railroad freight house will be exhibits and exciting multimedia presentations on New Jersey's railroads by former railroad employees who reveal what it was like working on the railroad more than half a century ago as well as local railroad historians. A special feature will be presentations by NJ Transit on their Operation Lifesaver program for kids and adults. Want More? There will be antique trucks and fire engines, old buses from NJ's Public Service bus company, and several vintage military vehicles on display adjacent to the museum. This facility is closed to the public and the last time it was open for one day public event was three years ago! The event is held is rain or shine. Admission is free. On Sunday at 4:00 pm, Macculloch Hall Historical Museum will host their 15th annual Poets in the Garden event. Poet James Richardson will present his work in the museum's historic gardens. The event promises to be a wonderful opportunity to hear this established writer share his poems in a unique setting. James Richardson was born in 1950, graduated from Princeton in 1971 and is now Professor of English and Creative Writing at Princeton. He teaches beginning and advanced poetry workshops, Prosody, Reading Literature: Poetry, Contemporary Poetry, and Lyric Poetry. His books include By the Numbers: Poems and Aphorisms, which was a 2010 National Book Award finalist and a Publishers Weekly Best Book of 2010, Interglacial: New and Selected Poems and Aphorisms, which was a finalist for the 2004 National Book Critics Circle Award, Vectors: Aphorisms and Ten Second Essays, How Things Are, A Suite for Lucretians, As If, Second Guesses, Reservations and two critical studies. Visitors to the museum can also enjoy the current exhibit The Other Side of War: The Civil War on the Home Front. Life on the home front was not easy for loved ones whom the soldiers left behind. Women played an important role in the Union war effort; starting the U.S. Sanitary Commission, serving as nurses, gathering goods and raising money for the soldiers all contributed to the Union victory. The exhibit features letters to loved ones back home, Lincoln memorabilia from the Museum's collection including a plate from his White House china, and a document signed by Lincoln as President and also by the Secretary of War. The museum will remain open until 4:00 pm when the program begins. Admission is Adults $8; Seniors & Students $6; Children 6 - 12 $4. Members and children under 5 are free. Entrance to the program is included with regular museum admission. In the case of inclement weather the performance will be moved indoors. The museum is open to tour the house and view exhibits on Wednesdays, Thursdays & Sundays from 1 to 4 p.m. General Admission: Adults $8; Seniors & Students $6; Children 6 - 12 $4. Members and children under 5 are free. The last tickets for admission are sold at 3:00 pm. For information, call the Museum weekdays at (973) 538-2404 ext. 10 or visit www.maccullochhall.org. 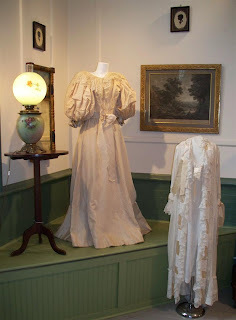 Macculloch Hall Historical Museum, 45 Macculloch Ave., Morristown, NJ 07960. This Sunday, the Battleground Historical Society will open the Village Inn museum located at 10 Water Street Englishtown between 1:00 - 3:00 pm for guided tours. Visitors will view the first floor restored as a tavern. The second floor has two new exhibits: one depicting the former aspects of Englishtown, including never before seen local artifacts donated by area residents. The second room is dedicated to Englishtown's historic church, built in 1751; it served as a hospital during the Battle of Monmouth. Included in this exhibit are many maps, pictures, souvenirs, and memorabilia never before exhibited. For information call 732-888-6061 or visit www.thevillageinn.org. A $2.00 donation is requested. Join the Montclair Historical Society this Sunday for a program entitled "Celebrities by the Dozen" at 3:00 pm. The Gilbreth Family, of Cheaper by the Dozen fame, called Montclair home. Come hear town historian Mike Farrelly tell you about this family and 11 other celebrities who came from Montclair. Suggested donation $5.00. The program will be held at 108 Orange Road, Montclair. Call 973-744-1796 for information or visit www.montclairhistorical.org. "Double Exposure: The Twin Lights Through the Artist's Eye"
The Pascack Historical Society will open a permanent new display area, named "Spotlight on History," on Sunday between 1:00 and 4:00 pm at its museum, located at 19 Ridge Avenue, Park Ridge. The purpose of the new exhibit space is to allow visitors a close up, focused look at a few select artifacts every few months. The event is free, open to all ages and will run until November 15. The first "Spotlight" includes a wedding gown worn by Park Ridge resident Ida Cole (b. 1868 - d. 1957) when she married John Blauvelt Hopper (b. 1869 - d. 1943) on December 13, 1892 at the Pascack Reformed Church in Park Ridge. Other items on view will be an American mahogany tilt top candlestick table (Hudson Valley, circa 1825-1850) a Bilbao looking glass (circa 1795-1810); a framed 1746 Boydell engraving belonging to the same Pascack Valley family for two hundred years, a glass “Gone with the Wind Lamp” and some of a wedding trousseau worn by the late Harriet Van Riper Tice (b. 1901 - d. 1999), owner of Tice Farms. Volunteers from Pascack Adventures, the educational arm of the 70-year old non-profit Society, will be sponsoring “Hands on History,” a guessing game for visitors. Participants will try to identify an array of small historical artifacts that will be on display. Families are encouraged to work as teams. Prizes will be given to the winners. Free tours of the full museum will be conducted continually. For further information visit www.pascackhistoricalsociety.org or call 201-573-0307. Complimentary coffee/tea/juice and cookies will be served throughout the day.